We all enjoy Morris’s genial account of Kelmscott Manor in his ‘Gossip on an Old House on the Upper Thames’, published in The Quest in November 1895 and reprinted by May Morris in 1936. But this appears not to have been the article he originally intended to write. For in Edmund New’s ‘diary’ of his visit to Kelmscott in October 1895 he notes, on Wednesday 9th, that ‘much rain had fallen during the night; we therefore decided not to drive to the Coxwell barn as we had intended, but that I should draw inside the house and Mr M. should write an article on it instead of on the barn’. To the long list of Morris’s unwritten works we can therefore add his ‘Gossip on an Old Barn near the upper Thames’. I have often argued in this blog that in the case of works that Morris intended to write but either didn’t start or couldn’t finish, we should now write or complete them for him – or at least speculate in some detail as to how they might go. Could we do this, then, with the non-existent Coxwell Barn piece? 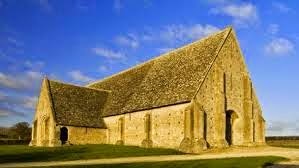 We certainly have much testimony as to his intense admiration for this thirteenth-century structure; and we also have what I regard as May Morris’s own attempt to reconstruct the unwritten article, which she does by quoting Thomas Hardy’s evocation of the Shearing-barn in Far from the Madding Crowd in volume XVIII of the Morris Collected Works: ‘I know no writer’, she there remarks, ‘who has understood and interpreted so keenly the past and present spirit of these majestic buildings’ (p.xxix). 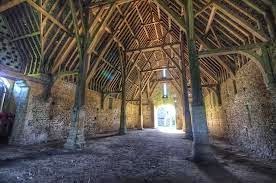 We might also note that critics have occasionally been so irate that we don’t have a detailed Morrisian account of Great Coxwell Barn that they have even proposed a trip there as a desirable new episode in News from Nowhere itself! Tony, there is also a "Gossip on Romance" by Robert Louis Stevenson, available online at https://ebooks.adelaide.edu.au/s/stevenson/robert_louis/s848mp/chapter15.html. So it seems that the "gossip" is a quaint old nineteenth-century genre we've completely lost sight of in our more hurried times!